Posted on 28 June 2015, in Cottage Cooking Club, Farmers Market and tagged Cottage Cooking Club, greens, potatoes, salad, tart. Bookmark the permalink. 10 Comments. Dear Betsy, you certainly picked two winners there – the Tart is absolutely wonderful and very versatile and your are absolutely right about the tart case being suitable for a larger tart pan. I took measurements and I decided to use my beloved pan with the high sides, . good call – it worked – no ricotta salata at the cheese monger either but regular creamy ricotta also does the trick. (I am still looking for those beet tops…I will find them some day and make this again) – I used sorrel and spinach and we loved it. 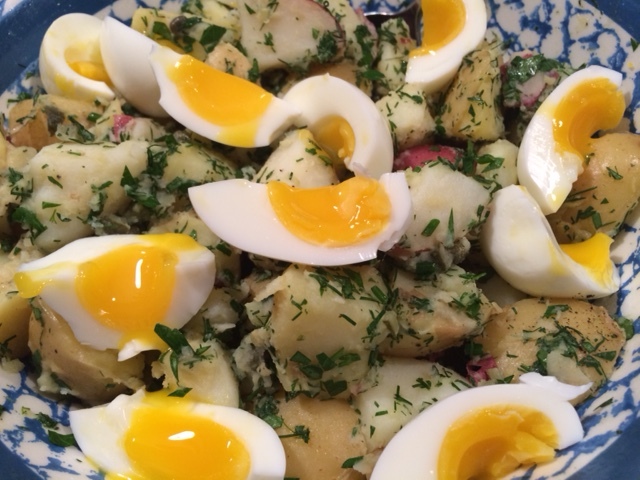 The potato salad is fantastic – our favorite these days. Yours looks terrific with all those fresh herbs – love your presentation in your beautiful bowl. Hi Betsy, another interesting month on different style preparations. 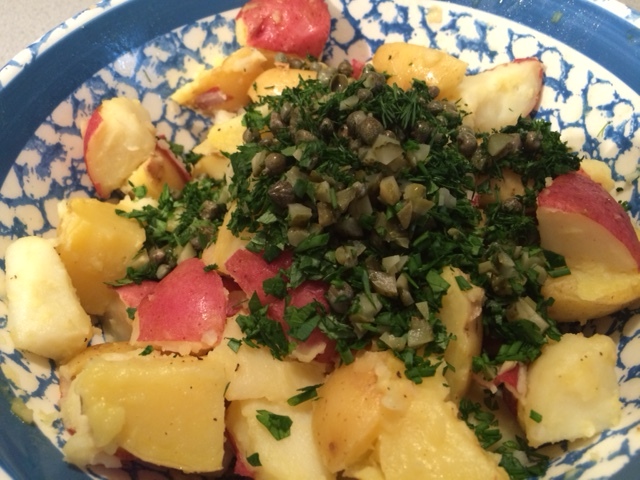 I too make a Dijon Potato Salad. I’m eager to give this Tartare a go this evening as it seems to be met with mostly positive response and am fond of the ingredient combination. Love your steaming idea on the potatoes, I used to do that, and I’m thankful for you bringing it up because you have just brought back a process I thought was quite good, yes, thanks. 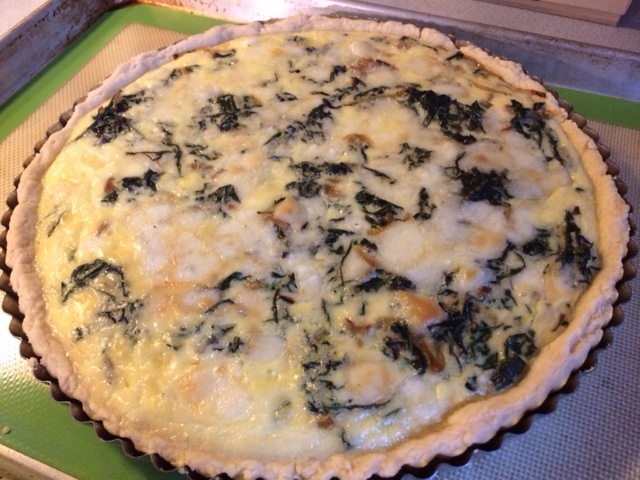 Thought the tart was lovely too with the ricotta and chard and would also serve well as a luncheon dish. See you around. Thanks for another nice month. Betsy, both of those dishes look fantastic! I too made the potato salad and I didn’t think of steaming the potatoes. Definitely a better idea as I agree that the texture of boiled potatoes is not my favorite (unless I’m going to mash them!). That tart with manchego as a sub sounds lovely. I’ll have to try that out. YUM! Both dishes look wonderful Betsy. I, too, prefer vinaigrette dressings on potato (or any) salad but this one was particularly good. How nice that you were able to add your garden fresh herbs to it. The tart is a winner too. I think any combination of greens and cheese would work well in it. I like your idea of making one per week – it’s such a delicious way to use vegetables. Great choices, and that tart is a winner all round! Hi Betsy, both of your dishes look delicious, wish I had made the tart after seeing and reading about yours. Such a great idea about steaming the potatoes. Will use that method when I make mine next time, otherwise I am standing by the stove top waiting and waiting because the second I walk away I forget. Another great month. I have never tried steaming potatoes. Now I’m intrigued. No pressure, but I do hope you have a chance to blog about your Dijon potato salad. I’m a sucker for anything with mustard….I read right past the “salata” part and made the tart with fresh ricotta. It was excellent. I’m so glad it’s finally time for summer vegetables! Great choices, Betsy! That tart was a winner for me…loved the flavors! I used kale and spinach in mine…no fresh looking beet greens. And we both loved the potato salad! Both your dishes look delectable! It was nice blogging along with some of our French Friday buddies this month!! BTW…my Sun-chokes are growing nicely…I was surprised to see them coming up! Pictures soon! Lovely choices this month, Betsy. I had hoped to make the salad, but ran out of time. It sounds so very delicious; and don’t you just love being able to walk out back and cut what herbs you need for a recipe? The tart looks good too. Sounds like it was a hit with many of you – I’ll have to make a note to try this one for sure.